Geek Deal of the Day!!! 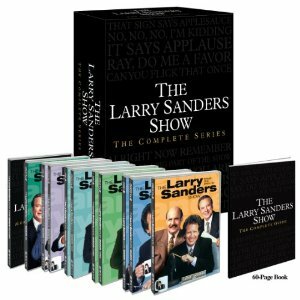 ‘The Larry Sanders Show’: Complete Series on DVD 60% Off. Only $59.99!!! Today Only. The Geek Deal of the Day is one amazing show. Possibly one of the funniest shows ever on television. I really enjoyed watching this show. It had an all-star cast and was funny as hell. Every episode was funny as hell. So this set normally goes for $150.00, but for today and tonight only, it is a whopping 60% off bringing it down to $59.99. So take advantage of this badass offer that last until midnight. At long last, Garry Shandling s comedy series about the twisted inner workings of a late-night talk show, and its host, comes to DVD. All of it. Larry Sanders (Garry Shandling) is a neurotic late-night talk show host flanked by Artie (Rip Torn), his caustic, foul-mouthed producer, and Hey Now Hank Kingsley (Jeffrey Tambor), his hopelessly insecure, ethically inept sidekick. Off-air it is all train wrecks and egos, but when the lights go down and the theme music kicks in, you get late-night Entertainment Inc. at its finest. The Larry Sanders Show raised the bar for fearless, acerbic Hollywood satire. The innovative use of both video and film to distinguish on-air events from real-life happenings, displaying the jarring dynamic between the on-camera poise of Larry and his backstage neurosis, was brutally fascinating. And in the company of a patronizing, combative staff and a parade of A-list guests, more than game for putting their own celebrity in the crosshairs, you had a backstage pass to a Hollywood that was shockingly raw and hilarious. Also starring Linda Doucett, Janeane Garofalo (24), Penny Johnson (24), Wallace Langham (CSI), Bob Odenkirk (Mr. Show, Breaking Bad), Jeremy Piven (Entourage), Mary Lynn Rajskub (24), Sarah Silverman (The Sarah Silverman Program), Scott Thompson (Kids In The Hall), and written and produced by Garry Shandling, Peter Tolan (Rescue Me) and Judd Apatow (Knocked Up), The Larry Sanders Show was the hippest TV show . . . probably ever. Late-night would never be the same again. Geek Deal of the Day!!! HBO’s ‘Six Feet Under’ Complete Series on DVD!!! 63% Off!!! $65.99!!! HBO’S ‘HUNG’ COMPLETE 2ND SEASON BLU-RAY & DVD ANNOUNCED AND DETAILED!!! ‘How To Make It In America’ Blu-Ray & DVD Announced and Detailed!!! Geek Deal of the Day!!! ‘How To Train Your Dragon’ Blu-Ray!!! 69% Off!! Only $12.49!!! This entry was posted on Sunday, June 19th, 2011 at 5:49 pm	and is filed under Film, News. You can follow any responses to this entry through the RSS 2.0 feed. You can skip to the end and leave a response. Pinging is currently not allowed.